Arty Globe is an art gallery and gift shop that sells canvasses, prints and gifts based on the unique urban cityscape illustrations of Hartwig Braun. Gifts include items such as jigsaw puzzles, credit/travel card wallets, bangles, cufflinks, earrings, necklaces, cushion covers and zipped cases all of which are locally handmade. Monday - Friday 11am to 6pm. Saturday & Sunday 10.30am to 6.30pm. 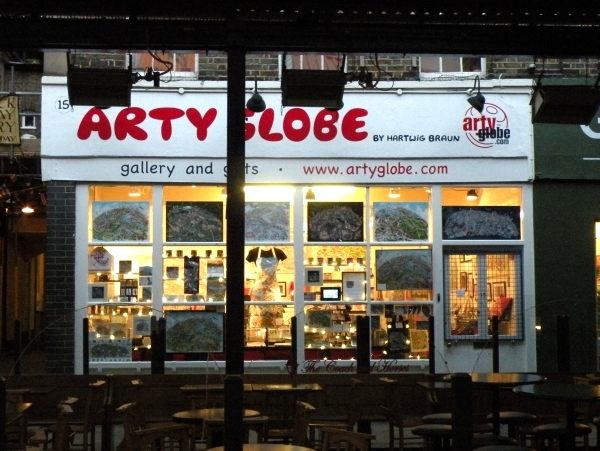 Arty Globe is located on Greenwich Market. Find your way to Arty Globe by public transport with Transport For London's Journey Planner.